The tag went into the machine all smooth. It came out cracked like this. I was blinded by greed, and failed to research the product thoroughly. The tag wasn’t leather – nor had the pants ever been washed. 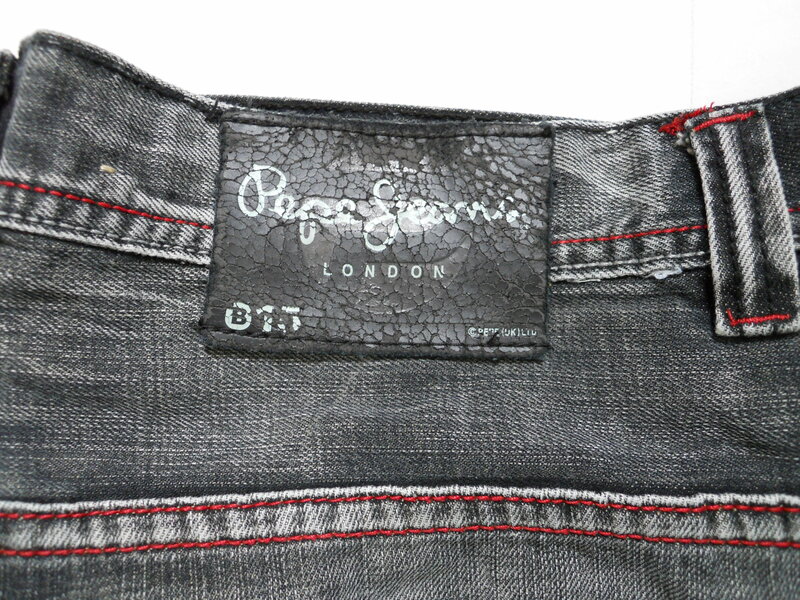 The tag doesn’t even look like a real Pepe Jeans tag, which is typically brown leather. This was cheap leather, and the branding was painted on. The first sign of trouble was the loose threads on the hem. There were loose threads everywhere, and I just ignored them. That was a real error. However, look at the stitching along the leg. There’s that thick stitching on the left, which I think is called a chain stitch, and the stitching on the right, which is called an overlock. 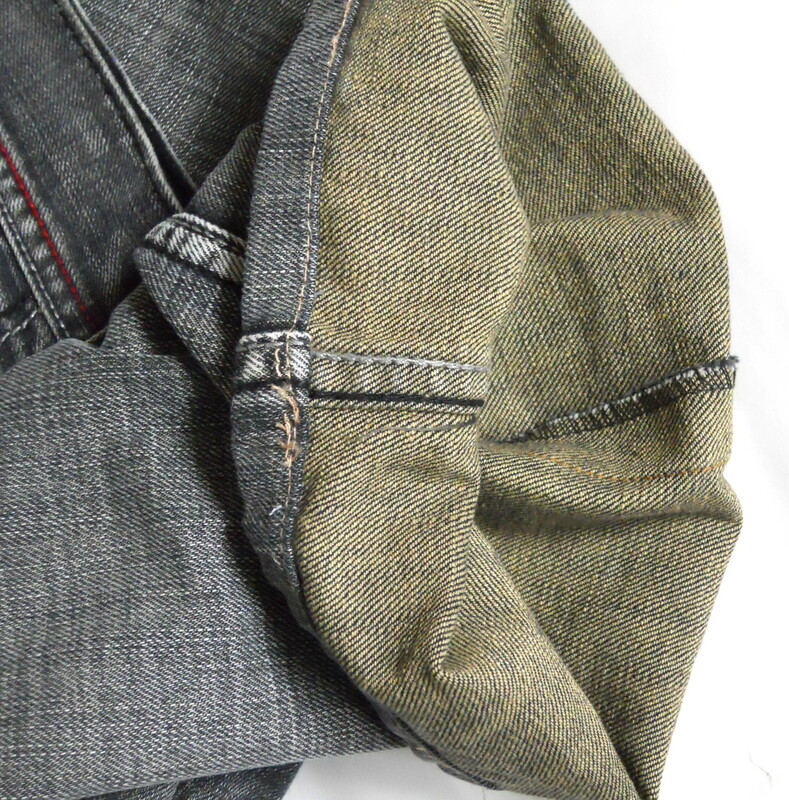 Both are dense with thread, which is a good sign that it’s a decent pair of pants. That overlock is more dense than the overlock on a pair of legit Levi’s! 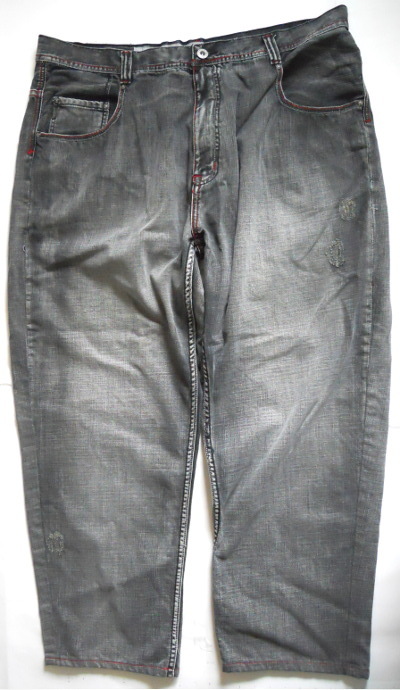 Still, look at a real pair of pants on the Pepe Jeans site. These are not the same pants, but it may represent what a real pair will have. 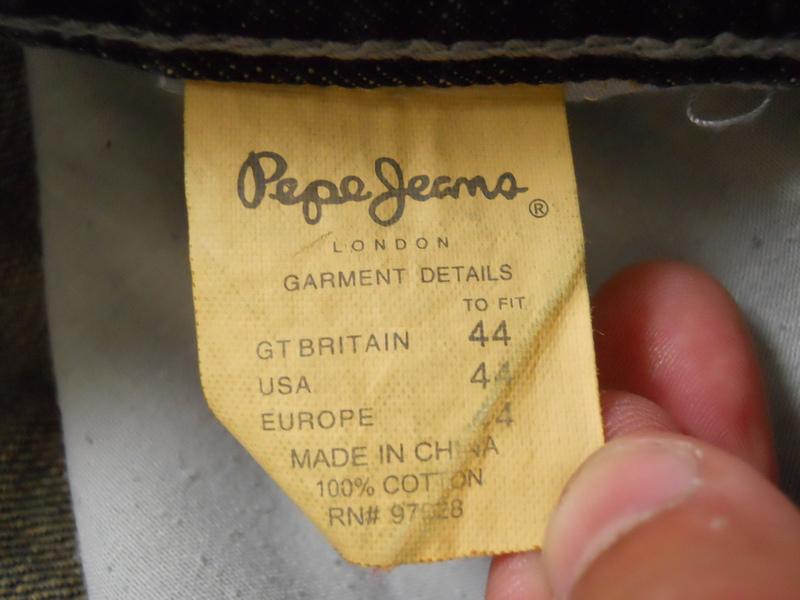 You can’t really get a good look, but the last photo shows the leg cuffed, and you get an idea of what Pepe Jeans really does. There’s no overlock. The edge is folded over and stitched, so there’s two two stitches on both sides of the leg, not just one side. I spotted loose threads on a few more photos. The third one even shows a broken stitch, where the machine choked up a little bit, and they didn’t go over it too well. While these threads are a “tell” that hints at the low quality of this item, they included bits that indicated that this would be real: the branded button, a tag on the fly, and the elaborate tag along the back. They added even more signs of being “real”, like lots of metal hardware. I don’t know if real Pepe bling looks like this. Look at that P logo on the zipper! Look at the two-color stitching all over the place. This is a decent fake. This last bit should have given it away, but I totally misread it. It’s the size tag, and it looks like it’s real. In fact, I think it could be real. I noticed that it was worn out, like this was a pair of used jeans. Now, looking back, knowing that the pants had never been washed, the tag should have been pristine. These pants are better than most of my jeans, so I might just cinch up my belt and start wearing them.